Typically, laminating is the most overlooked step in the graphic production process. When done properly, you can get a beautiful print with long lasting durability. But when done incorrectly, it can lead to application failures. Working with pressure sensitive laminates can be tricky but is a valuable skill. There are many different types of laminators available. More sophisticated laminators will sometimes have much larger rollers, which helps avoid wrinkles. They will also have more options, such as slitters, heat-assist, and multiple take-ups. In this video we will be demonstrating proper laminating techniques for pressure-sensitive laminates. We will use a base level model without heat assist, something found in many sign shops. A mistake at the laminating stage can lead to visual defects or application failures. This means reprinting, reworking and completely redoing the job. That means it costs you money. First of all, make sure that your working environment is clean. Clean your rollers properly with a tack cloth. Avoid using any types of cloths that contain alcohol. Over time this may dry your rollers out and eventually crack the rubber coating. The keys to a successful lamination are alignment and heat management. The first step is critical. You must properly align the print with your laminate so that everything feeds straight. Pressure sensitive laminates are designed for cold application. For this reason, heat is not necessary during lamination. However, many users like to use just enough heat to minimize silvering, which is a normal occurrence that usually disappears within 24 hours. If you do use heat, maintain a temperature between 100°F – 120°F. As the print feeds through, maintain a proper amount of tension to keep the laminate from wrinkling on the roller. Too much heat, combined with too much tension, will cause over-stretching. 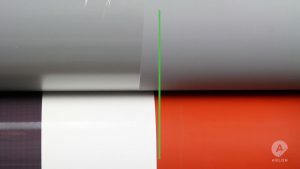 The most common error seen when laminating is “hour glassing.” See here how the laminate is no longer lined up with the print. Avoid “Hour Glassing” when working with pressure sensitive laminates. Avoid this and ensure a smooth application by feeding continuously and steadily until you have laminated the entire piece. If you follow these steps while working with pressure sensitive laminates, it will lead to a great looking finish and a successful application. Hi Sergio, The laminator used at 0:49 is a Seal 62 Ultra S.